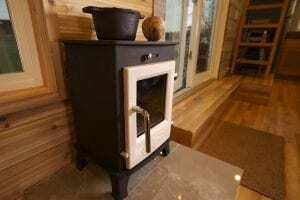 Adequate clearances are one of the two most important safety features of any wood stove installation. (The other is proper materials.) 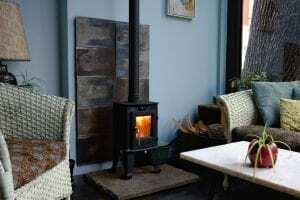 A properly installed and maintained wood stove can be one of the safest appliances in your home. But cheating on clearances can create a very dangerous situation. 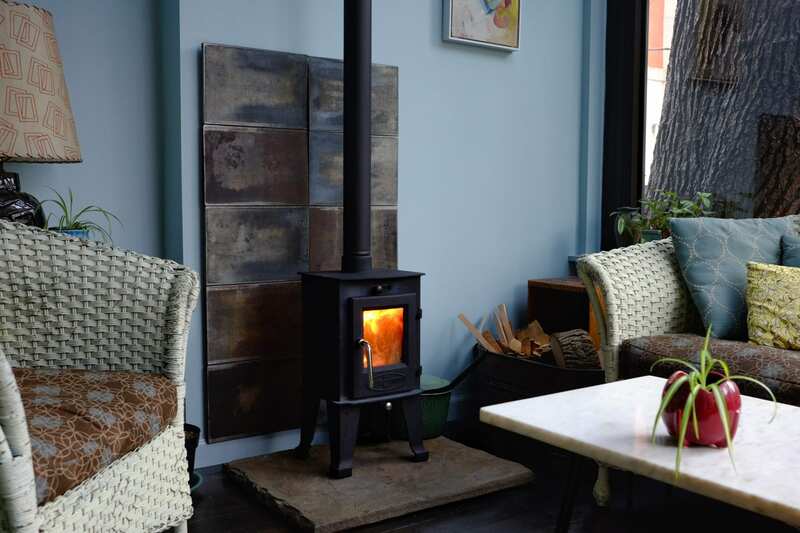 We get a lot of questions about photos of stoves that appear to have much closer clearances than allowed. "How are they able to do that?" Sometimes it can be hard to tell how close a stove is to a wall from a photo. Clearances may be OK, but appear in a photo to be closer than they actually are. People do frequently violate clearances and post the results online. Just because someone did it doesn't mean it's safe. In some cases, stoves are "staged" in a way that they could not be installed, and then corrected later. 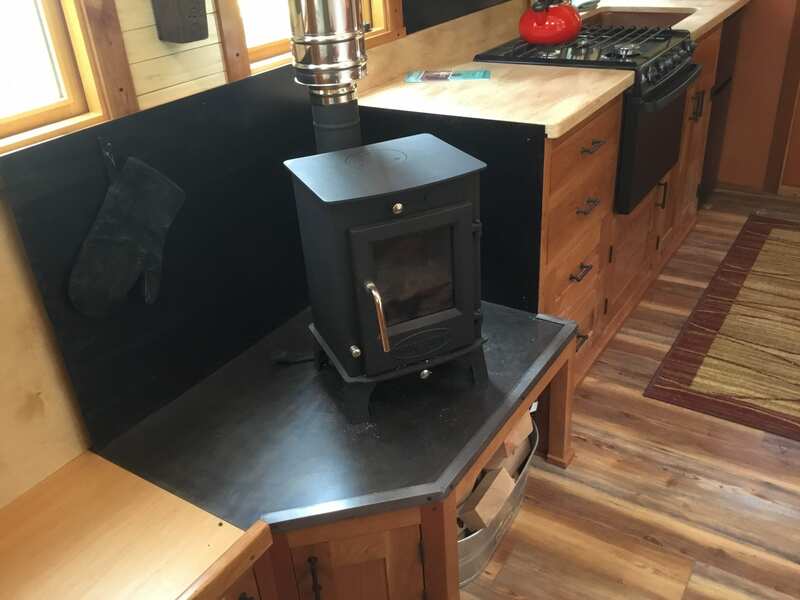 For instance, on Tiny House Nation S5E15, they didn't have time to install the flue system before filming the episode, so the set dressers just put the stove where they thought it looked best. 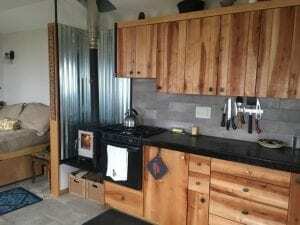 Photos on the episode show the stove way too close to the wall, but if you look closely, you'll see that the stove was not hooked up yet. Clearances are important because wood stoves get very hot while in operation. Combustible materials that are too close to the stove can heat up past their autoignition temperature, and catch fire. A spark is not required to start a fire, just heat, fuel, and oxygen. In most cases, clearance violations will not cause a fire immediately. As material is repeatedly heated, it deteriorates on a molecular level and its autoignition temperature begins to drop in a process is called pyrolysis. After months or years of repeated heating, a surface that "hadn't had a problem yet" can spontaneously burst into flames. To be safe, combustible materials should never exceed 200 degrees F. If you observe potentially combustible materials around a stove discoloring, that can be an indication that pyrolysis is occurring. But you won't always be able to see it. Clearance violations are an especially dangerous problem because they often don't cause a fire immediately. 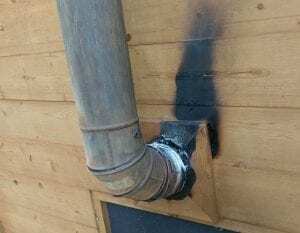 Sometimes pyrolysis is visible as discoloration or charring on the surface of combustibles, but sometimes the pyrolysis can occur inside a wall. 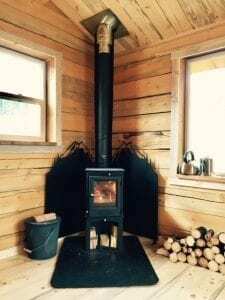 You could use your wood stove with no problems for months or years until one day, your wall catches fire from the inside without warning. Cheating clearances can also be caused by using improper materials. 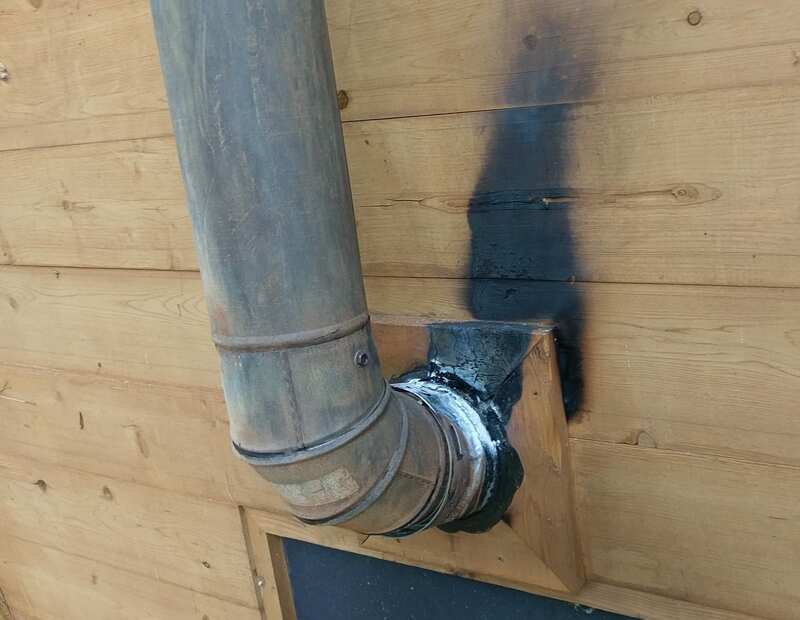 For instance, if you use pellet pipe instead of proper Class A chimney pipe to penetrate your roof, and you follow the manufacturer's suggested clearance to combustibles, you'll create a dangerous clearance violation. Pellet pipe is rated for much lower temperatures that wood stoves produce, so the clearances are calculated assuming those lower temperatures. Connect pellet pipe to a wood stove, and the manufacturer's rated clearances are no longer adequate. 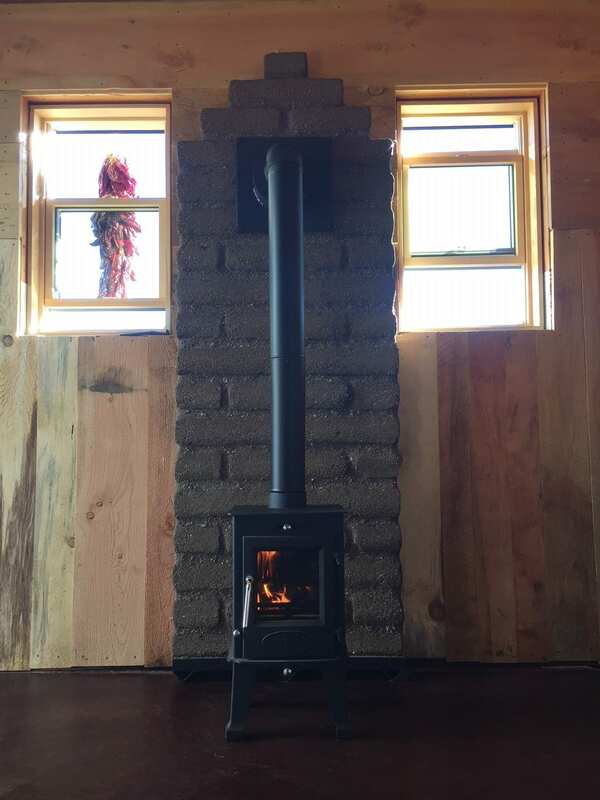 Wood stove clearances cannot be eliminated entirely, but they can be reduced significantly by using a properly constructed heat shield. It's critical that heat shields are designed properly, and that rated clearance reductions for the type of shield are followed. By far the most effective heat shields are the air cooled type. These shields are constructed with a sheet of 24 gauge or thicker sheet metal, or 1/2" or thicker cement board, with 1" of air space behind the shield and around the perimeter to allow free air flow. 1" heat shield spacers are available online or sometimes at your local hardware store for this purpose. Try to avoid placing a spacer directly between the center of the stove and the wall, since spacers can conduct heat through the shield to the combustible wall. It's usually best to place the spacers around the perimeter of the shield. The airflow behind and around the perimeter of the shield is critical for its success. As the shield is heated, the natural convection of air around the shield will keep the shield and the material behind it cool. Reduces clearances by up to 2/3 (18" becomes 6") when used as a wall protector, or up to 1/2 (18" becomes 9") when used as a ceiling protector. Clearances are calculated to the combustible surface. So, 18" clearance reduced to a 6" shield that stands 1" away from the wall would generally need at least 5" from the shield. How Big Should Heat Shields Be? Clearances are calculated in all directions in a straight line. The easiest way to figure out what surfaces a shield needs to cover is to cut a dowel to the rated clearance you're testing. For example, from the back of the Dwarf stove, the rated clearance is 18" to combustibles. With an 18" dowel, measure all points on the wall that you can touch with one end of the dowel, while the other end is touching the back of the stove. All those points must be covered by the heat shield. Do the same for the stovepipe and the sides of the stove at their respective clearances. You'll note a couple of things on this exercise. First, the heat shields will tend to be significantly larger than the profile of the stove or stovepipe. Second, the further away the stove or stovepipe is from the combustible material, the smaller the heat shield needs to be. We have found that heat shields attached to Dwarf stoves and stovepipe with 1" spacers are as effective as shields attached to the wall surrounding the stove. The shield still needs to be in the intervening space between the heat source and the combustible wall, but since the shield is closer to the heat source, its profile can be much smaller. Check out Nick's 5er installation video for an example of using shields attached directly to the stove and to the pipe to reduce clearances with minimal visual impact. If your stove is produced by a different manufacturer, attaching the shield directly to the stove or stovepipe may not be permitted, so be sure to check with the manufacturer. There are two other types of shields described in NFPA-211, but they're rarely used for tiny living applications. These two types of shields are no easier to construct than air-cooled shields, and they are less effective. Insulated shields are identical to air-cooled shields, but instead of 1" of air space behind the shield, you use 1" of fireproof insulation like rockwool or ceramic fiber. A shield of this type can reduce wall clearances by 1/2 or ceiling clearances by 1/3. Masonry shields are 3-1/2" thick masonry blocks with no air space, i.e. a standard brick wall. Shields of this type can reduce wall clearances by up to 1/3, and are not generally used for a ceiling. Any shield type other than the three types mentioned in NFPA-211 should generally not be used for clearance reduction unless that configuration has been tested. While shields with an amount of air space or insulation other than 1", or shields with a double-layer of sheet metal would likely provide some benefit, the amount of safe clearance reduction they would provide is unknown. Tile attached directly to the wall with no insulation or air space is not a heat shield. Tile will conduct heat directly through to the combustible surface behind it. Unless it's at least 3-1/2" thick, a layer of tile it provides no rated clearance reduction. Sheet metal attached directly to the wall with no air space will also conduct heat straight through it, and provides no rated clearance reduction. Spaces that are subject to building codes generally have specific requirements for clearances. If a stove is UL listed for residential spaces, you follow the manufacturer's instructions in the manual. However, most tiny stoves are not UL listed, so you may need to follow the local building code's guidelines for unlisted stoves, which typically require 36" clearances to combustibles in all directions. If you are using a heat shield to reduce clearances in a project subject to building codes, the shield cannot reduce clearances to less than 12" in any direction unless the shield and stove are specifically tested and listed for that purpose.